Across this timeframe the Australian economy experienced concerns following the tech crash, the boom period from 2003 to 2007, and since then the credit crisis that was ultimately renamed the GFC. The credit crisis is still playing out to a degree but spreads have started to tihten again in recent times as the chase for yield is on. The chart shows that the riskiest distribution is the long duration, 10+ Yr index, and its not surprising as 10+ years is certainly very very long in duration and the smallest spread of returns is the short duration 1-3 year index. As expected BBB shows greater risk than AAA, but what about the returns? 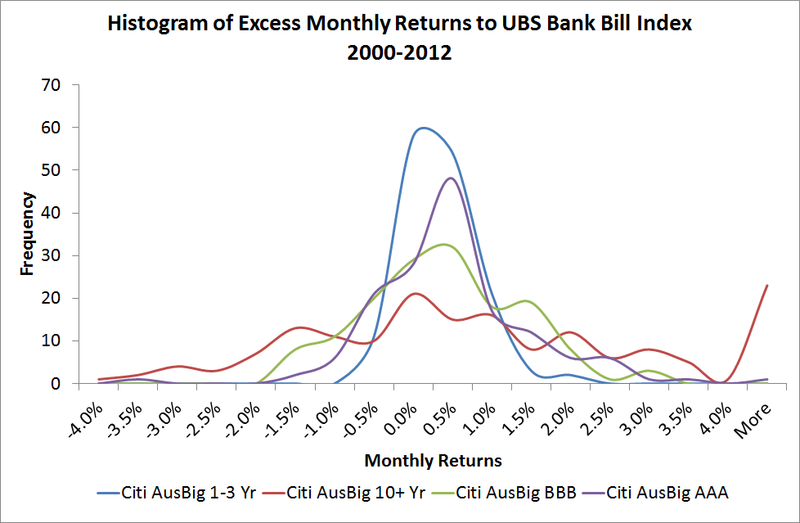 The above table confirms that the long duration 10+ strategy is the riskiest, although it did have the highest monthly return average of 0.21% along with the higher credit risk of BBB. However, the higher credit risk strategy with a lower standard deviation produced the better and best Sharpe ratio. Because the volatility was so high for the long duration index, its Sharpe ratio ended up being the lowest so the return per unit risk didn’t quite cut it compared to the others. My final however, is that return and risk are not the end of the story when it comes to fixed interest. As we know, or should know, fixed income investing is assymetric, or in English, there is limited upside and much greater downside risk. That assymetric risk is what is not in favour of the higher credit risk BBB strategy and is reflected in its negative skew whih you can see in the histograms also…the left side is a little bigger than the right side of the charts. Anyway…these results are the past and possible reflect the potential of risk for fixed income investing today…AAA prices and the longer duration risks are probably quite high. Although its somewhat independent to the past, I do believe shorter duration, higher investment grade credit risk is likely to produce the better returns from fixed income over the next few years…assuming economic disaster does not re-occur (and that is still a possibility).